This product is not available for purchase at this time. Please consider our A100R Anemometer instead. Please contact our Sales Desk for more information and availability updates. 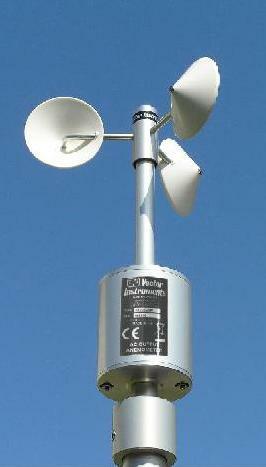 The A100AC is a new addition to the A100 Series Anemometer line-up. This product looks very similar to the other models in the A100 Series as it uses the standard, well proven, A100 Series body and bearings with the First Class R30/K rotor. A system of magnets and coils creates a low-level AC (sinusoidal) output signal as the rotor rotates, providing 2 pulses/cycles per rotor revolution. Because the A100AC output signal frequency, calibration and amplitude is very similar to that of low-level-AC output anemometers made by other manufacturers, the A100AC can be subsituted in many existing installations in order to obtain the First Class performance, reliability and durability of the A100 Series with little or no alterations being required (other than altering the slope/offset entered into the datalogger). The A100AC can of course be used in new installations too, and is compatible with a wide range of dataloggers from many manufacturers which have low-level-AC input channels available. No power supply is required for operation (unheated models) making the A100AC ideal for battery/solar operated remote installations. As is the case with other A100 Series anemometer models, every A100AC's rotor is wind tunnel tested (at a single wind speed of approx. 9m/s) by comparison with a set of reference rotors which are themselves traceable to national standards, and an individual calibration figure is provided on a factory calibration certificate. - MEASNET/IEC61400-12-1 calibration is available. - Anti-icing heater (HE-4 or HE-4/12V) versions are available. This instrument is intended for use in various meteorological wind measurement applications, mounted on a mast or pole and connected to a data-logger, signal conditioner or similar measuring equipment. The A100AC is a higher specification, higher performance �drop-in replacement� for installations/loggers using low-cost/low-spec plastic low-level AC output anemometers where there is a need to upgrade to an instrument with true First Class characteristics, e.g. for sites with complex/hilly terrain in �Wind Assessment� applications. Output amplitude Clipping/Limiting: +/-12V approx. (other lengths available - up to 115m can be fitted during manufacture). (Red, Blue unused in standard version but used for heater in /HE4 version). Screen = not connected at anemometer. Page Rendered in: 0.251921 seconds. - Powered by Mambo.